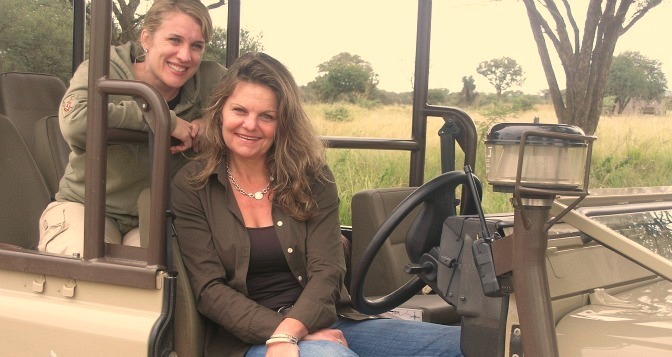 Up and out with our ranger to great herds of topi, impala, buffalo and ostrich mating dances. We go to small village of Nata; I venture into the centre of the local market; piles of dry fish from Lake Victoria, massive papayas, dried casava and cones of red millet for sale. Music is blaring and he local “Texas Bar” is open … Saturday night after all. Julie waits in landrover a little unnerved by stares – not many muzungus come this way. We continue to high school with Grumeti Reserve conservationist who teaches students at local environmental school set up on the Reserve. Students come from this school – five teachers for 650 students and they all feel lucky to finally have a school, meals prepared for 250 boarders over open fires. 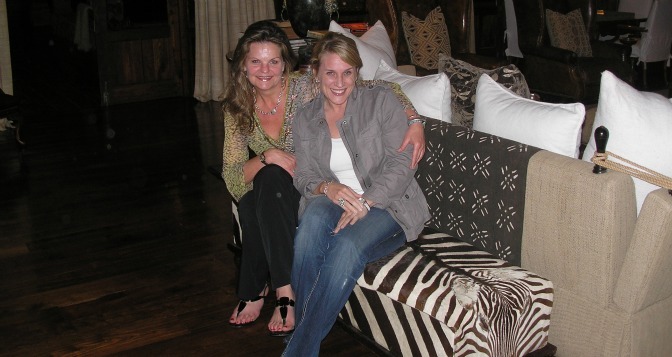 Destination tonight Singita Sabora Tented Camp- set around acacia tress on the flat plains of the Serengeti. Classic 1920′s safari style tents, campaign furniture, lit by lanterns, bathrooms with claw foot tubs and leather floor, outdoor shower and all amenities one could wish for. Game drive at sunset bring us up against pride of 14 lions just metres away – they make direct eye contact and lick their lips – makes one a little edgy. Sunset drinks with a dozen giraffe against the horizon and back to camp. Night filled with hyena calls and far away lions. All so still and so quiet that sounds are magnified. 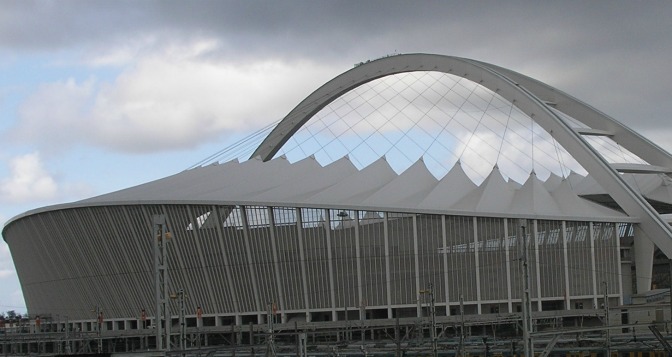 Cape Town is ready for FIFA – the airport is sparkling new, roads in and out of the city have been upgraded and the new Greenpoint Stadium is sitting beautifully on the seafront waiting for the games to begin. Up to Durban in the northern KwaZulu Natal province of South Africa – the holiday capital – a place of surfers and beach bars and hotels serving fancy cocktails. 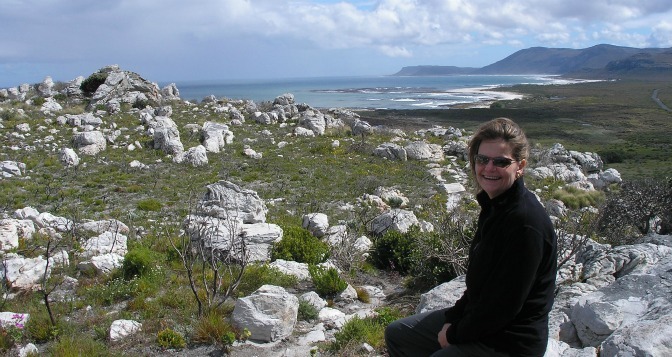 Gateway to the Drakensberg Mountains, Zulu Kingdom and the battlefields of the Zulu Wars – and a beautiful new stadium awaiting world cup cheering. 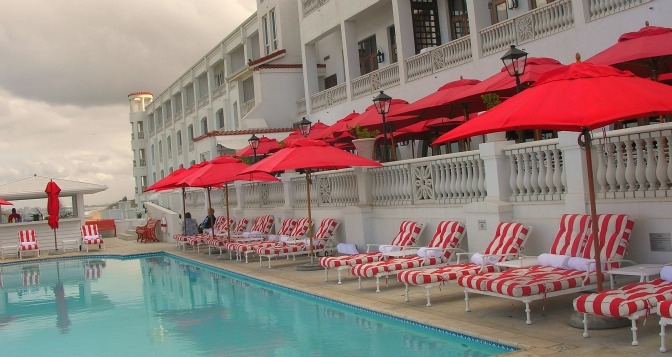 More recently worthwhile also for the re-opening of the fabulous Oyster Box Hotel at Umhlanga Rocks. Perfectly perched overlooking the lighthouse and serving since 1947 the now famous Durban Curry Lunch on the terrace overlooking the Indian Ocean – a character filled oasis reminiscent of Raffles – with an African twist. Speaking of twist … South Africans take great pride in their range and sometimes irreverent slang. I mention only a few – “just now” which means something could happen in the next 2 minutes, the following day, next week or perhaps never; “bunny chow” – nothing to do with eating small rabbits but in fact a spicy curry served in a hollowed out loaf of bread; “skabanga” Savanna Dry – a delicious cider enjoyed at any time of the day (an SMS message “quick skabanga?” recieved at 10.30 am can be readily agreed to); “shark tank” – nothing to do with a horrible death while swimming but is Durban’s rugby stadium where all who enter as competitor should apparently loose hope; Johannesburgs’ Gauteng Province car plate initials are ”GP”- referred to by everyone who does not live there as standing for “Gangsters Paradise”. Indaba is the largest travel industry event in Africa – held annually in Durban and partially the reason for my trip. New lodges wowed, new friends forged and thankful to be part of such an incredible group of dream makers. The biggest message of the gathering was the need for conservation – working solely to protect, preserve and buy back habitat in co-operation with communities. Creating environments where people and animals truly live together – as simple as mobile banking, depositing immediate compensation into the account of a tribesman who lost a cow to a lion – he sees the money go into his account on his mobile … he does not kill the lion. Direct benefit for direct results. And at Indaba and elsewhere in Africa the most talked about country at the moment is Zimbabwe. 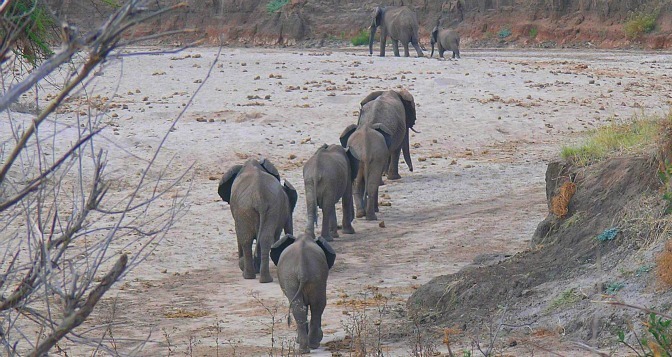 Operators are optimistic, Zimbabweans are moving back, lodges are opening and there is excitement as some of the best game viewing and most beautiful locations are again on the cards. African Bush Camps has opened up in the legendary Mana Pools area on the Lower Zambezi and in Hwange National Park with its’ over population of elephant … Bumi Hills on the banks of Lake Kariba is awaiting immigration and customs clearance approval for international travellers into the Zambezi Valley, there is talk that British Airways will resume flights into the capital of Harare within the year. A serendipitous and emotional final night dinner on the Durban seafront with Zimbabweans currently scattered across the globe from Cape Town to India, Canada, Australia and Tanzania … vowing a reunion next year somewhere on the Zambezi and a new era of progress. Leave the cool south of Durban and fly 4 hours north to Dar es Salaam – the wave of heat hits you like a damp blanket when you exit the airport terminal – even at 8.30 at night. 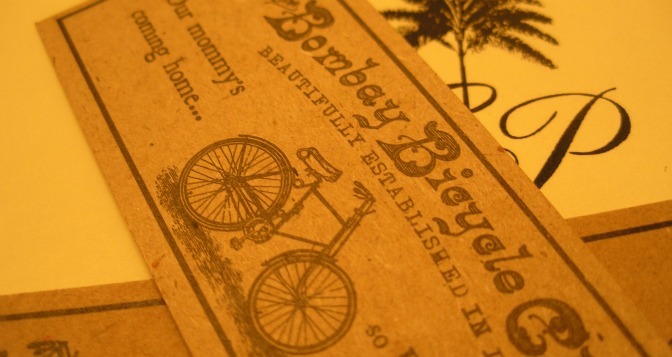 Drive through unlit streets lined with stalls set up in the presumable cool of the evening – everything is for sale. Here a row of red patent leather womans shoes, there a tray of mangos, further on a bucket of warm lemonades and smoking roadside cooking pots serving customers sitting on low benches lit only by hurricane lanterns. Our destination Oyster Bay on peninsula overlooking the sea. A Masaai night watchman opens the gate and we arrive to a greeting from staff dressed in the cool white robes common on the Swahili Coast. Inside Demetra, our incredible host, with cold lemonade and the serene mono-chrome interior of the hotel. 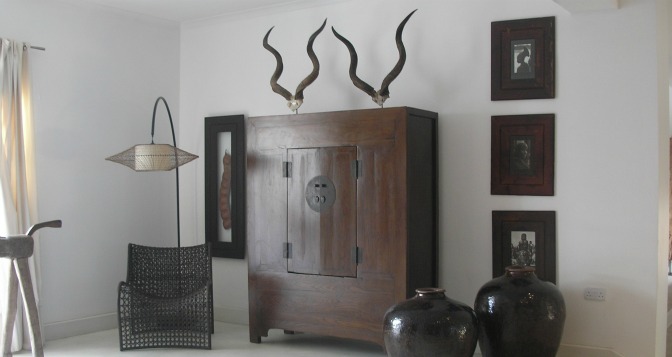 Minimalism and maximum africa all at once. There are only 8 rooms – king beds draped in white net, cream concrete floors, african drum tables, huge bathrooms with clear glass showers and eastern shutters – all perfect – like the sister property Beho Beho in Selous Game Reserve to the far south of the country. Dinner with fine company of guests from Nairobi and the Congo. A lap pool sits out in the garden just asking for company but we leave at 6.30 am for the Serengeti. Dar in daylight looks a lot better but it is still HOT. 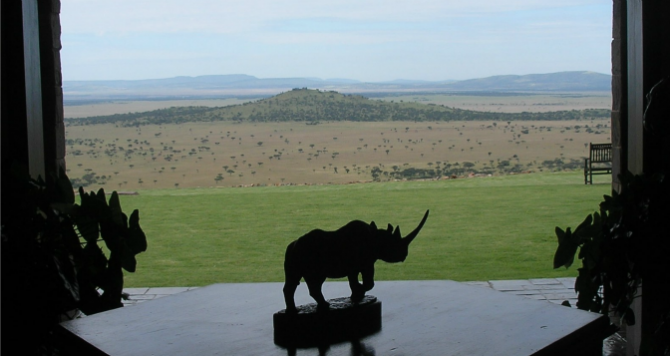 Hop on a charter to Arusha and from there across the cone dotted highlands and on through to the western Serengeti. Destination Singita Sasakwa Lodge in the Grumeti Reserve. Airstrip a red slash on the huge green grass plains. Sasakwa defies description. Perched on a high ridge, suites fan out from verandah fronted public rooms. Vintage African country house bedroom and sitting room; glass fronted bathroom with views of huge Africa – and private infinity pool. A pre-dinner game of snooker and bed … although it seems more appropriate to retire to ones’ palatial chambers – they are so spectacular. Up and out with our ranger to great herds of topi, impala, buffalo and ostrich mating dances. We go to small village of Nata; I venture into the centre of local market; piles of dry fish from Lake Victoria, massive papayas, casava and piles of red millet all for sale. Music is blaring and the local “Texas Bar” is open … it is Saturday afternoon after all. Julie waits in landrover a little unnerved by stares – not many muzungus come this way. We continue to high school with Grumeti Reserve conservationist who teaches students at local environmental school set up on the Reserve. Students come from this school – five teachers for 650 students and they all feel lucky to finally have a school, meals prepared for 25o boarders over open fires. Unexpected layover in Dar with ex-pat friends. A city dismissed at first sight actually fascinating. Lovely old colonial house overlook Indian Ocean, sunset sailing from the yacht club with mining execs posted here. We visit the Slipway to shop for beautiful beaded belts and jewellery, lunch of fresh shrimp on patio of Sea Cliff Hotel. 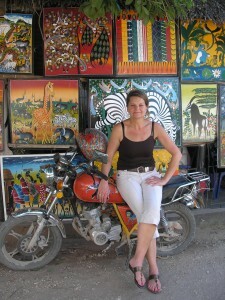 The dusty Tingatinga market is overflowing with paintings in typical style depicting daily life and social issues. On the way home stop at roadside vegetable stand for huge pineapples and mangos – have forgotten what it is like to bargin for everything. Friend, originally Australian and here with family on mining contract, has taken to buying old dhows from fisherman in villages up and down the coast and turning ancient, weathered wood into furniture. Ex-pat community from all over the world – international school and good hospital – hardship posting if you have to actually work here but social life, sailing, endless beaches and diplomatic parties off set all that.